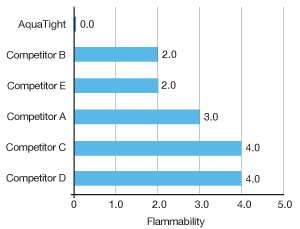 aquaTIGHT®’s waterproof grout, sealer, and additive products are less costly, less volatile, and less flammable than other products on the market, in addition to having a quicker drying time. 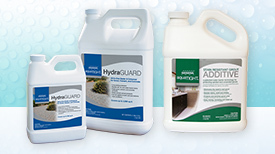 aquaTIGHT® works as a sealant for a variety of hard surfaces, including stone, brick, concrete, tile, and grout. Unlike other sealers, it is selective for these surfaces and will not leave hard-to-remove films on metal, glass, clothing, or carpets. 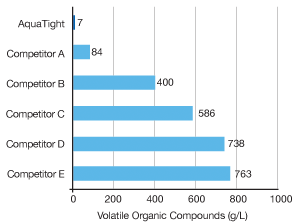 aquaTIGHT® is low odor and low VOC. Cleanup is simple—simply wash up with water. Drying time is short—no curing is required. Grout, cement, and other hard surfaces all have an inherent porosity and an affinity for water. This causes these materials to soak up liquid water, which can result in mildew, mold, and surface degradation. Other sealers can leave hard-to-remove films and can prevent trapped water from evaporating. Waterproof grout is essential. 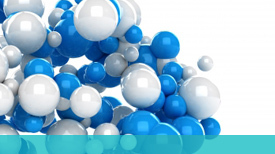 aquaTIGHT® works by getting on and inside the hard surface’s pores and creating a hydrophobic monomolecular layer at the air interface. The resulting hydrophobic surface repels liquid water, shielding these surfaces and preventing water sorption, while allowing trapped water to escape. Because aquaTIGHT®’s waterproof grout is not a polymer film, it is resistant to abrasion and common household cleaners. All aquaTIGHT® products can save significant time in installation projects because of its quick drying time. 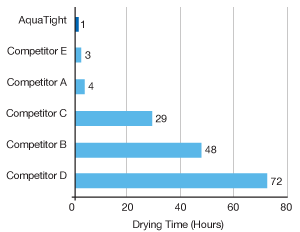 In fact, aquaTIGHT® dries faster than any of its competitors. When mixing your own simple grout, aquaTIGHT® GA can save you even more time and money! This innovative grout additive provides all the patented aquaTIGHT® protection from the moment you install your project, which means there is no need to return to the job site days later to seal the grout. Think of the time and money you’ll be saving!